Powers/Abilities: As Gryphon, Gryaznova's body has been reconstructed with genetic engineering and nanotechnology to make her an efficient predator. She can reshape her hands into claws, and possesses enhanced strength, speed and reflexes. As a Prime Sentinel, Gryaznova could transform into Sentinel mode, in which she had superhuman strength, flight, energy blasts, and could adapt to her opponents' attacks. She also had access to a variety of advanced technology, including a neural leech that could stun a victim when placed on his forehead. History: (X-Force I#68 (fb)) - Ekatraina Gryaznova was a member of a rogue faction of the CIA operating out of El Salvador, and had kidnapped Dr. Rebecca Schuyler. When the mutant mercenary Domino came to rescue Schuyler, Gryaznova was linked to the combat droid Jericho to stop her, but Domino used an electromagnetic pulse device to short out the entire compound. The feedback from Jericho being shut down put Gryaznova into a coma for ten months. (X-Force I#68 (fb)/X-Force I#69 (fb) - BTS) - Gryaznova was brought out of her coma by Dr. Joshua, Dr. Chandra and Dr. Ogada of the Aguilar Institute, who set her up as a candidate for Operation: Zero Tolerance. She was then approached by Bastion, head of Operation: Zero Tolerance, who offered to restore her mobility by transforming her into a cybernetic Prime Sentinel. She agreed, hoping that she could have revenge upon Domino, and to serve the Aguilar Institute's interests. Two years after she had been revived, she was active in the field with Operation: Zero Tolerance. (X-Force I#67) - When members of the MLF took hostages at the Wakeman Oncological Research Center, Gryaznova came to the scene with a party of Operation: Zero Tolerance agents. When the X-Force members Domino, Sunspot and Siryn disguised themselves as a news crew to get inside the facility, Gryaznova recognized them, but let them go by without letting on so that Prime Sentinels planted inside the facility could handle all of them. Meanwhile, Gryaznova and the other Operation: Zero Tolerance agents captured X-Force members Meltdown, Rictor and Shatterstar. (X-Force I#68) - When the fight inside the facility was over, Gryaznova led Operation: Zero Tolerance inside, and collected Tempo, Dragoness and Domino as prisoners. FBI agent Ritter attempted to have their captives released, but she refused. She was then contacted by Bastion and let him know what had happened-- but claimed that Domino had escaped. Gryaznova brought Domino to the Aguilar Institute's Dr. Chandra, Dr. Joshua and Dr. Ogada. After telling Domino who she was, Gryaznova placed her into the doctors' care, and they planted a device in her nervous system. (X-Force I#69) - Gryaznova placed a neural leech on the men guarding Meltdown, Rictor and Shatterstar so that Dr. Joshua, Dr. Chandra and Dr. Ogada could study them. However, Moonstar, Sunspot and Siryn came to their friends' rescue, and Moonstar knocked Gryaznova out with a psychic arrow. (X-Force I#82 (fb)) - When Bastion discovered that Gryaznova was a traitor, he reprogrammed her body's nanotechnology, turning her into a freak. She was recovered by the Aguilar Institute and brought to a facility in northern California where they used radical genetic engineering to counter the nanotechnology. They transformed her into the Gryphon, a "hybrid of nature's most efficient predators." (X-Force I#82) - When Jesse Bedlam and Domino invaded the facility's site so that Domino could confront Gryanova, they were ambushed by agents of the Institute, and Domino was turned over to the Gryphon. Gryaznova intended to have her revenge upon Domino again, but Jesse returned with X-Force to save her. Jesse released Domino from the force field Gryphon had placed her in, and finally nullified the device Chandra, Joshua and Ogada had planted in her. The Gryphon fought Domino, but was ultimately beaten when she stood under the force field cell, and Bedlam reactivated it, crushing her back. Badly injured, she activated the facility's self-destruct in an attempt to kill Domino, but Domino and the rest of X-Force escaped before the facility exploded. Comments: Created by John Francis Moore, Adam Pollina and Mark Morales. 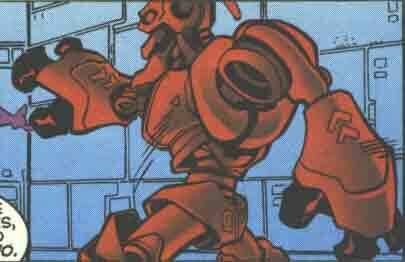 Jericho was a prototype combat droid designed by a rogue CIA faction to be an ultimate fighting machine. It was controlled by Gryaznova from a distance using a cybernetic link. Jericho was sent to stop Domino when she raided the CIA's El Salvador complex to rescue Dr. Schuyler, but Domino used an electromagnetic pulse device to render Jericho inert. Jericho was slagged, and the feedback put Gryaznova into a coma. Dr. Schuyler was a neuro-cybernetic scientist from Stanford, California. She was captured by a rogue CIA faction to design the cybernetic link apparatus for their Jericho combat droid in El Salvador, but she was rescued by Domino.